I wanted you to write to you today to tell you to let her Mommy Jennifer know that Ma Cherie is here with all of us. She got here safely and I met her right over the Bridge as you had requested when you talked to me at our tree the other day. Cherie is so cute and she is very happy to be free of cancer. I showed her the house next door to me and Barkley where all your sons and daughters are. She thinks Safari is quite handsome and by the way he sends his love along with everyone else. Cherie told me she was an only cat so she was super happy to move in with Safari, Tarzan, Cheetah, Freedom, Jane, Lucky, Shauna, Grayson, Tiger, Tom, and Smarty. She said she could not believe there were so many cats to run and play chase with! She seems to be having a great time. We all built her bed before she got here but she spent her first night curled up with Safari and Cheetah in Safari’s bed. That Safari is quite the ladies man you know…he even went down to the Kit Kat Cafe and bought her some new toys of her own. She started playing with them and batting the little mousies over to Cheetah and Shauna right away. I know Jennifer is probably feeling so very sad and you said she would probably find solace in going to church today so that is why i wanted to send this on Sunday. Tomorrow is Rosh Hashanah- the Jewish New Year. You know there is nothing we do not celebrate here! Religion here is all mixed into one. Tell Jennifer that it is a time of renewal and faith for goodness to come in the New Year for our family and friends, in case she is is not familiar with its meaning. Cherie was really happy to be arriving at such a time of celebration she said. And she asked me to tell Jennifer a few things. She said this: Tell my Mommy that I was so happy when she and your mommy found her at that crazy shelter in Chicago. 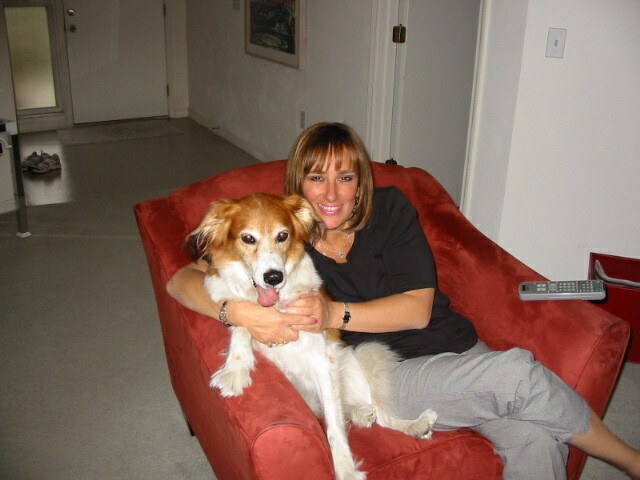 I loved my mommy so much because she worked from home and I was able to be around to help her all the time. Tell her that I was glad we got in one last road trip, it was fun. Oh and tell her I was sorry for eating the Lilly’s that made me so sick and she said thank you for saving my life even though it cost a fortune. She said that she and Jennifer had a great life dedicated to each other. She also mentioned that she was worried that mommy would be so sad that she would drink too much wine, so she said not to! She said she wanted her to celebrate her life instead of mourning it. I told her that you and I wrote a whole book about this subject and as the Leader of Love here in Hyfryd, I have to tell Jennifer what we have come to know. You are only separated by a physical presence . Cherie lives in your heart and you and hers, that is something I know for sure. And Cherie said one last thing. She wanted Mommy not to take too long before helping another or maybe even 2! Cherie said that it would have been nice to have another cat to play with so her advice is to consider a pair, perhaps siblings? she said. She told me her mommy used to talk to her a lot so she will need some kids to keep her company, cuddle and greet her with meows at the door. Cherie said that there are so many who need homes and rescuing is the greatest reward, as she has come to know this is true. Cherie said the the purpose of the Rainbow Bridge is that one crosses a new life begins for those who cross and one who awaits a new home on the other side. Cherie said she will be with you so keep your eyes wide open for the love that awaits. Part of me, she said, will be in the next one or two (1) that she sends your way. Walking through Buhl Park the other day, I learned that Bailey’s tree is now prime real estate, since they are building a doggy park right behind her tree! When I heard this news from a man working over there I was elated. Bailey always brought so much happiness to everyone she interacted with that it just figures that the doggy park would be nearby. Like in Hyfryd, where she, Safari, Tarzan, Cheetah Freedom, Shauna, Lucky and Jane and the rest of her furry friends reside, over the bridge, there will be happy barks and yelps, smiles and laughs from all who go to the doggy park area and she will be there to see all the action. 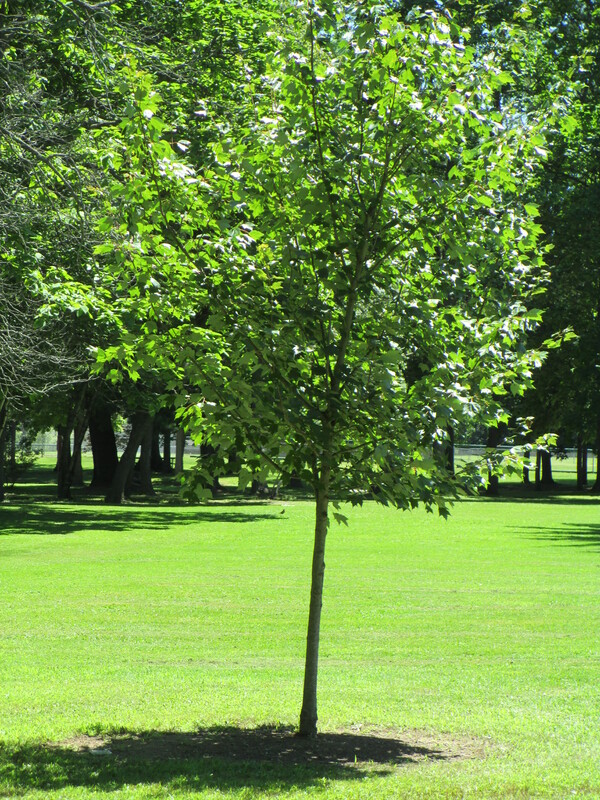 When I looked for a sapling to dedicate they showed me different trees all around the park. 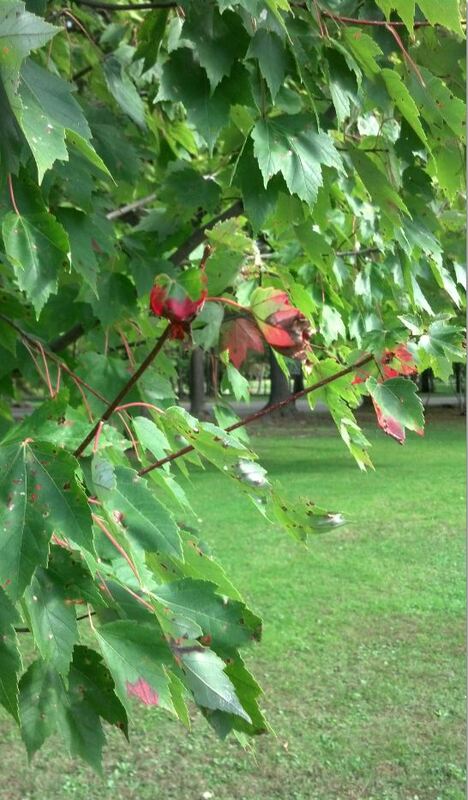 For those of you who have read this blog, or our book, Letters to Each Other, you know the tree is a Red Maple and its type was chosen because of her red Coach Collar, which she wore so proudly. I chose the location because it had a view of Lake Julia and the country club. Being that Bailey was a diva (deservedly so) I thought it was the perfect spot. 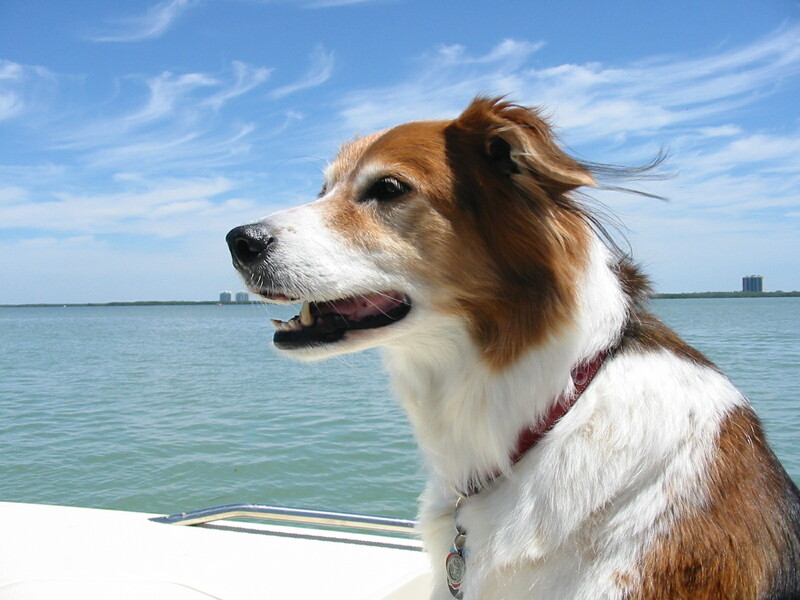 Bailey enjoyed the finer things in life and we were always happy to give her everything. 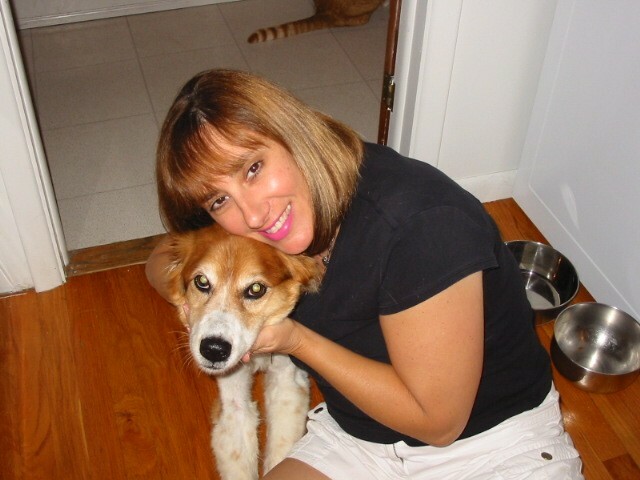 As a senior adoption, you especially never know how much time you have and a lot of time was something we could not give her yet the 3-1/2 years she shared our love and home, were her best – that I know – it’s what gives me comfort. Even though she crossed the bridge and I can’t see her physically, I always see her at the tree. Although she is buried in our yard, I always think of her as being at the tree. The park is my peaceful place. I spend a lot of time there and I spent a lot of time with her there, as I do now with Joy. It’s one of the most beautiful places on earth and now it will be even more lovely with the addition of the doggy park, right in Bailey territory. I keep this picture in my den right next to my bed. We have so MANY great pics together but this is a favorite because it’s the day you brought me home and we both were so very happy. Every year at this time I do get a little sad because it does not seem fair that I only had 3-1/2 years by your side. I am SO grateful you adopted me as a BEAUTIFUL senior, but I wish you were mine since I was a puppy. However, I still squeezed SO much LOVE into those years with you, Safari and Daddy and so did you of course. When I think of all the adventures I had in both the FL and PA houses it’s amazing! Mommy, I just want you to know that I always miss you when the New Year turns because it sort of ticks off another year that we have been physically apart and it makes me sad. But, I get happy when I think how the last part of my life was the BEST part and I think even for old people that is important because it is what you remember the most. You are the best Mommy ever and when I talk about you everyone is jealous! Ha! Please tell Safari, Daddy and of course Joy, whom I hand picked for you, that I love and miss them too. By the way, Tarzan, Cheetah, Freedom and Lucky send their love as well – they miss you so much too. We all do, but we know that our pictures are all OVER those houses and most of all in your heart. 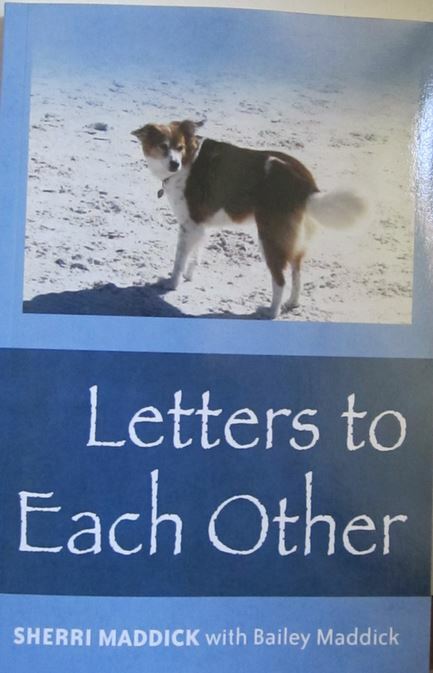 Our Book, Letters to Each Other is Published! PS I LOVE this picture of us! I just had to write ON the day. My note last night was very short, I know, but I told you that I would write today as well and I am keeping that promise. Since the first fo the year, classes have been very busy. There seems to be a lot of bad things going on down on earth with animal abuse and we find it very sad here in Hyfryd. We have seen too many of our animal friends coming to the classes, especially Loving You 101, to find about why they were harmed there. I have had to enlist Onwen and Telwyn to assistant teach and Barkley of course. Tarzan, Cheetah and Freedom and Lucky have taken over the cat version of the class and actually rewrote some of the lesson plans to be more fitting for cats specifically. They are doing an excellent job – all of them, but of course they would because they were your babies!! It’s just all so sad. So I have really been working hard on that class in particular and I wish it did not have as many participants as it does! Enough with all the sad stuff though. I wanted to say that I know it was just 9 months on the 12th that Joy came to live with you and I see she is doing well and is VERY happy and playful. I wish she would stop the itching, as I know you want to help her and you have done so many different things. I do think you will find that it’s the just the environment; plants and things in nature. She will be fine. Joy si a tough one I can tell. She has a real spirit to her. She reminds me of you SO MUCH! I knew she was perfect for you and that is why I led her to you. This is your first birthday with her in your life too! I cannot believe that you are 54. You look good though! My wish for you mommy is to always have good health because if you have it then you can take care of everyone because they need you to and you are SO GOOD at it!!! So I wish you a very, happy year ahead and this is OUR year for the book! YAY! I am so excited. You have GOT to finish the editing already! I know, that is your least favorite part, but it is work that needs to be done so get busy! You are almost done but I am thinking you are scared to be done with it. Don’t be. We are already working on book 2 in the series. We will never lose this EVER! I will always be next to you, near you and in communication and so will you. It is just us and part of who we are. 2013, Our Letters Are Late! WOW! We have never been so late in writing back. It’s a new year and it is already February 6th! I think we are both guilty, but I have a great excuse which will make you very happy. I am almost – ALMOST – done editing the book. We are on our way, or shall I say, you are on the way to being the famous doggie diva you have always wanted to be. The person we are working with is Sara Ann. She is very nie and isn’t it funny her name is Sara, even spelled the way I like? Remember I told you that it was going to be a lot of work and as it turns out it really is! The key has been finding blocks of time for editing and after I get all the pages done I have to do the painstaking task of choosing pictures to go into your book. The fact that you are so beautiful does not help matters, but I have to limit the number we can use. The other thing I had to do was change the theme of this blog and I had taken just about forever to make a decision until I found this one, which oddly is called Chateau. That seems fitting for a Princess like you. I felt the next series of letters should look different on here at least. So to say things have been crazy busy is an understatement and I am sure that your classes are well under way since you said you were going back to school on the 7th of January and here we are a month late! I wanted to bring you the exciting news about the book. I am working as fast as I can! Write me back and let me know how the new year started for you my sweet girl. I feel like there have not been enough signs lately, except Sara’s name- which I truly knew was your doing and I love you for it. The title is Letters To Each Other. We took Joy on the boat for the first time and I took a picture just like the one I have of you. In the next letters I will send them side by side. You will like it. I miss you sweet girl. Write me tomorrow, please. I long to hear from you. I am SO SORRY I should have written sooner! I was so busy finishing all the classes before the break, so I am sending you this adorable picture of me and you with hopes that you will forgive me. Oh yeah, I’m Bailey, you ALWAYS forgave anything I did! hahaha – Although let’s face it, I never was really bad ever! I know yua re saying, “yes that is true,” right now! Sometimes around the holidays all the critters here in Hyfryd really have a hard time with missing their people, but Onwen and I try to teach them that the “spirit” of the holidays are really always there – just like you and I know each other is just a whisper away. That is what I teach the people here. I try to explain that everyone will be reunited with their people in the future – some sooner than later and vice versa. I want people on both side of the Rainbow Bridge to be grateful for what they have now; that is what is most important. So many people take it all for granted. You and I never will. I am so happy that you adopted Joy. It’s funny she has the perfect name for this season, huh? I can see she makes you laugh like me. We are very similar, that I see. I was just more outgoing than her. Remember how you thought I was so friendly that I would just go with anyone? I never would have, you know. Joy, on the other paw, would bark at them and protect you to the nth degree! I like that quality in her, actually. I can see how much progress she has made already in her socialization. You just keep taking her places and she will do fine. She is QUITE the squirrel chaser like I was, huh? Very funny! I do have to say that I am ready and happy for the holiday break from school. I don’t resume classes until January 7th. 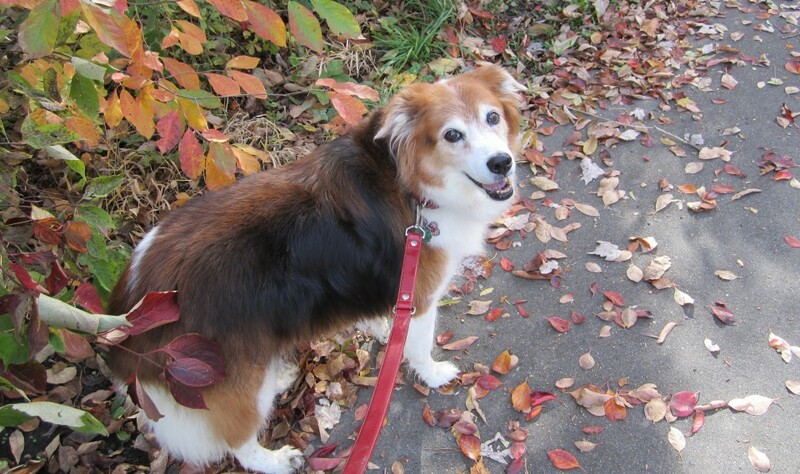 I never thought I would be THIS busy over the Rainbow Bridge, but hey, what’s a Border Collie to do? We are working dogs and I love helping people. I always think about that movie, It’s a Wonderful Life that we watched each Christmas. If you had not adopted me, I might never have been a teacher. I certainly would not have had the great experiences in my senior years that you guys gave me. It was so great of you to adopt a senior dog, really, cause nobody wants the older dogs and cats. Of course I should not say that – there are some, but for the MOST part people want the young ones. We certainly chose each other and on this second Christmas without you, papa and safari, I am thinking about that. I am thinking how grateful I am to have had a wonderful three years with you because the first part of my life was not good and I block it all out. You truly loved me with all your soul and heart and I feel that everyday, even today over the bridge. Guess what? We only have three more stories before we go into a book! I am SOOOO excited!!! I cannot wait. We ARE going to do a second one too, right? Yes, I figured as much. That is great because there is so much to say and so many people to help understand how to deal with this new part of life! Oh and I wanted to tell you that yes, Tarzan, Cheetah, Freedom, Lucky and a bunch more others will be here with me, Onwen and Barkley. Barkley has been so great at school. I have given him a new class to teach come January. He will be teaching a class of very young folk who crossed way too early due to accidents, just like his. He is such a wonderful guy I just love his enthusiasm. Write me soon, okay? I promise to write quicker! We have to move on to the 100th blog!!! – I love you and will talk to you before Christmas. 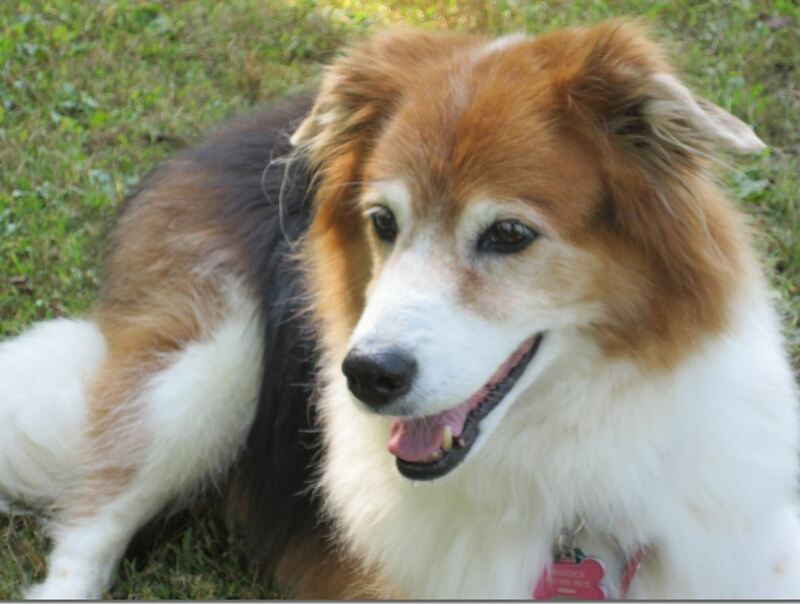 All my love, Bailey Girl…. Joy had big paws to fill upon her adoption, but the funny thing is, you did such a great job in helping me find her on www.petfinder.com she is perfect. I will show you a picture of her in the Santa hat at the end of this note. I cannot help but think how playful the two of you would have been together. True, Joy is a young one and you were my senior girl, but you both have equally sweet dispositions. Look at your face in this picture. It is so precious you should hang it in your den when you get my letter and show Onwen and all your friends. I hope that you will write to be when you get your Christmas break next week. I think you said you would be off school for a long break – and I am sure much-deserved. Here is the thing though, we only have a few more letters before it’s time to get the blogs together for the book! I know you are so excited and so am I. It’s going to be lots of work but you and I do not mind that, do we? I hope you will put up a tree and decorate it with some cute stuff. I put one of your pictures with Santa out in the living room – so cute. Miss Joy would NEVER pose with Santa! I think that she would bark at him! haha! I might try it next year though! I started going to the dog park again. The first day was hard since you loved to go there and Joy REALLY loves to go – we were there today and people talk about how they miss you but they love Joy. It’s funny I was not sure that she would like it there and I could not have been more off-base. She loves it and I am very happy about that. She plays so well with the other dogs and they all love her. She is very gentle just like you. The holidays are bittersweet for me. It’s only our second Christmas without you but I am focused on the book and getting that done and I am so thankful that we have worked on this project together and we will continue and make a whole series of books with the hope of helping others come to terms with the loss of their animal companions. Work to do! Here is a picture of Joy with her Santa Hat for your den: She was not too thrilled with having anything on her head but I did it while she was sort of sleepy and would not mind as much! haha! Oh how I love you both. Write to me soon my sweet Bailey girl. Let me know how you and your friends are celebrating the holiday. I hope that you will also be with Onwen, Tarzan, Cheetah, Freedom and Lucky and whomever else you love. PS – Safari wanted me to send you his picture as well. He was half alseep – I will work on new ones! Mommy! I am so sorry this is the longest it has ever taken me to write you back and you HAVE to forgive me! Of course, being your Bailey girl, you will! If you remember, I told you in my last letter, that we were SO busy with the new classes and the influx of new students that time just seems to slip away but now I am on Thanksgiving break and have 10 days off. After that I will teach until 2 days before Christmas and then I don’t go back until after the new year whew! It has been crazy and again, I am sorry and I have missed you. I am sending you this picture because I know it is one of your top 3 favorites and it reminded me of Thanksgiving. Why? You must wonder since it was not taken on Thanksgiving. It makes me recall how grateful I am for all of the wonderful experiences you and papa shared with me, I know we went ont he boat several times and I think you thought I did not like it, but i loved it. I was just always worried about peeing in the boat even though you said I could! The stupid bladder cancer always made me feel less in control than I wanted to be. I am SO glad that when you cross over the Rainbow Bridge you have no health problems! It is so great to just be a regular doggy again and pee when you simply have to, not constantly! Interestingly, that brings me to my next bit of information. I am starting another new class! This one is for people who pass before their time, lets say – because of an illness – like me! It seems that there is a lot of resentment that some people have here that they have not done all they could have or they feel they got ripped off of being loved more than they were. These people really need this special class because they hold a lot of sadness still in their hearts. I will help them learn how to turn that around and still feel close to their families, but give them learning tools to move on and do good things here in Hyfryd. So all of this recalls my thankfulness. I know, I know, you are thankful for me too – THAT goes without saying! haha! I am watching you all the time. Joy is interesting. She is soooo much like me – a little princess – she actually listens to you much better than I did – she is not as stubborn as me, it seems, but you know us Border Collies, at heart we are all stubborn and want our way. However, we give back 3000 percent and more with our love, right? Right! So I just wanted to say Thank you for all of your love and all of your continued love and support. I know you miss me as much as I miss you. I feel it as much as you do. If you are wondering if I am cooking Thanksgiving for Onwen and Company, I am, of course and Tarzan, Cheetah and Freedom and Lucky will all be here, a long with a slew of others. I am starting to cook on Wednesday there is so much to do and you know HOW MUCH I love TURKEY! Well, I will wait for a letter from you now. I am glad that you made it down to Florida for the winter and Joy was good on the trip. I knew she would be. She is loving the old neighborhood, I am sure. Tell Angel and Zoe-Zoe I say hi. I love you mommy and thank you for the best part of my whole life – the part with you, papa and Safari. Kiss them for me please. As for you, my kisses are all around you. Did you see that I am holding on to my green leaves? Only a couple of red tips so far, that is all you can see. October is not my favorite month and I know it is definitely not yours either. I don’t really want to focus on how I left you this month because “the sad-day date” is still far off yet, but a year has sure travelled fast hasn’t t? I know you feel it has as well. I did NOT want to leave you, but my body did not want to perform anymore I guess and the best way to continue my love, kindness and good work was to wind up here in Hyfryd, where I am doing great in all those departments. Since teaching the classes on life after the Rainbow Bridge, I too have realized so much about life on earth versus life on Hyfryd. I love that my body feels so good all the time here. I often think, is that worth not waking up next to our bed anymore? I try to make sense of those type of thoughts but realize that life is just life, filled with happiness, sadness, rewards and expectations, but what is most important is love and knowledge. There is nothing more important than love and as you know, there is nothing so pure and simple as the love between a man/woman and their animal companion. Nothing. 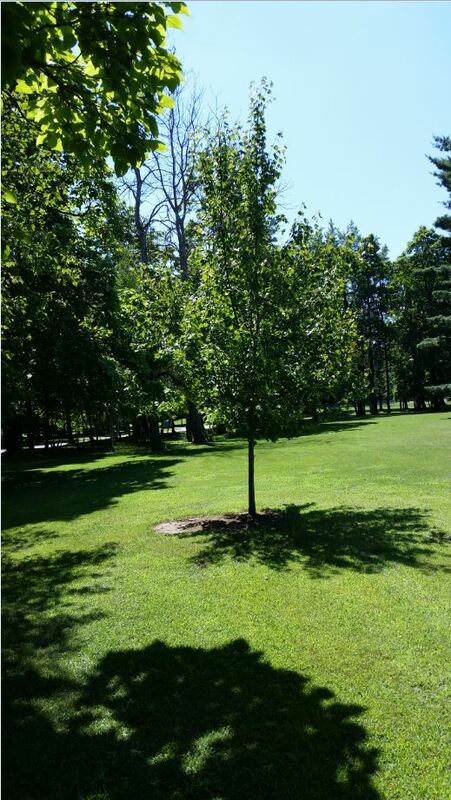 I love that you planted our tree in my honor and I love that you visit it constantly. I know the visits to the tree at the park are more meaningful than my special place in the yard. You know why, don’t you? Of course it is because you and I loved walking in that park together, just as you do with Joy now. The time we spent there – each moment was perfect (except for the couple of times you fell! That was funny sorry!) and happy. 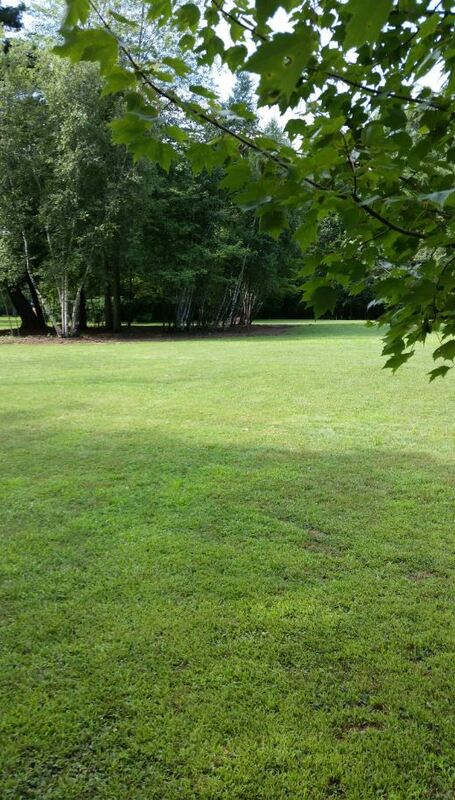 My special place is of course right outside the door to our sweet home, but Buhl Park, while it is everyone’s home, can be your home in the minutes and hours when you walk there. So for now I am holding onto my green leaves. Even though my color is red, I am not shedding them for winter quite yet. I am staying as green for now just for you, with just that tinch of red. Like the tree there, I have grown here in Hyfryd. You taught me how to be grateful and mostly – loved unconditionally. I try to pass on all those qualities to my students. They tell me I am doing a good job because they are learning how to live here without their families and when you first arrive it is a difficult adjustment, but if you can find ways to contribute then it becomes acceptable, sort of. I will never not miss you and I know, by watching you every single day, that you feel the same. It was funny in Chicago the other day when your cousin asked you about how you came to love dogs when you had cats your whole life (and still do, of course!) and you mentioned April’s influence and Marla, your former vet. If I never did, then I have to thank April for that because if it was her love of us dogs that originally rubbed off on you then good for her because she did a great job of making you crazy about us! Ha! Of course I know you would be anyway because, as Marla always said, it’s a different relationship. It is. Especially me and you. One of extreme kindness, caring and endless love.